I have a subscription to Newspapers.com and every so often I jump onto the website to search for articles about our Del Principe and Ciolli relatives. I found a very interesting one page article from the Chicago Tribune dated Sunday April 19, 1914 which contained my great grandfather Pietro (Peter) Del Principe’s name. The photos are amazing however the author’s writing skills are certainly different from what we would read in todays news stories. There are 2 photos of the author playing Pietro’s hand organ. You can read the whole article by clicking the pdf here Chicago Tribune Apr 19, 1914 however it can be hard on the old eyes. Zoom in to read the text. 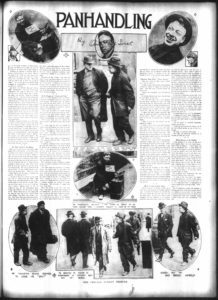 The rest of the article is interesting and I was able to create a visual for myself of what downtown Chicago was like in 1914 based on the photos and the authors narration. This was a fun find for me and I hope I can turn up more newspaper articles about our ancestors.